Rosewood Buttons: Literal or Not? Yesterday, the bead shop hosting the challenge posted the results on its website. I was not the winner, and this I am okay with. It was my first bead embroidery cuff, after all. I respect the amount of time and skill that goes into creating a bracelet of this sort, but what irks me is that the other seven entries are nearly identical. 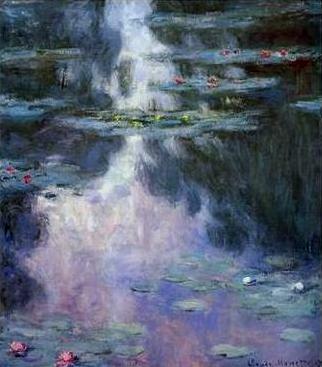 Julie Hauri-Foster, Monet's "Water Lilies, Night Effect"
What I like about it, and what I'm proud of, is that it's not so literal. I used pink beads around the cabachon as a lily with green crystal circling it to hint at a lily pad. The green and mauve seed beads were meant to represent water rippled with reflections, much like Monet's paintings, where my inspiration came from. I should have known from the charms that they wanted something more literal. I'll keep this in mind for next time. When I get it back, I will be snipping most of them off. remember this was your first entry-not your last! I prefer yours- really nice colors and style!